Your literature book selection is off the charts. You are set for guided reading groups for the next ten years. But then you realize, you lack a good selection of informational text. Your class library doesn't have enough titles to make one guided reading group, and your school book room is inadequate as well. You want to make informational text not only a part of your teaching, but you want to make it engaging for your students as well. Believe it or not, there are some great informational text websites out there that you can start using right away. Here are some great websites (many of which are free) that will help teach informational text to your students. This is probably our favorite informational text website. It does a great job of finding informational text articles that relate to many different areas in both science and social studies. For example, there are many articles on Westward Expansion, Civil War, Slavery and so many more. The great thing about this site is that you can select a grade level or lexile level and many articles can be written at different levels so you can use them for guided reading groups. Check out the website here! This has been a popular website among teachers for quite some time. It has short informational text articles that students can read. The articles are of high interest and often relate to current events that are happening in the world. A nice feature is being able to select the grade level and the CCSS that you want to assess as you can see from the graphic below. You can find Newsela by clicking here. Your class does need a subscription to the magazine in order to access this site. You will be issued a class code that students can enter onto their digital devices. They then have access to not only the articles online, but also vocabulary games and even videos about the topics. The articles are highly engaging. The teacher guide even comes with CCSS aligned questions that you can use to assess your students after they read each main article. You can find Scholastic News here. When you create your class roster, each student will take an 8 question pretest that will help assess your students' reading levels. As students take the quiz, depending on if the questions are answered correctly or not, the quiz adjusts to your students' levels. Once a students' level is determined, s/he is given informational text passages to read and answer questions. If a student gets a question wrong, it is explained why the answer was wrong which is a great feature. This site would be great for individualization when not meeting in guided reading groups. There is a great teacher component where you can see the students' data on the quizzes and see if their reading levels are moving up, going down or staying the same. You can find the website by clicking here. Common Lit is a newer website that we have just started using. What we like about this site is that it has historical documents along with informational text. There are also special features to help lower level students as well. It is called Guided Reading Mode. See the image below. Below is an example of what CommonLit has to offer: short stories, poems, historical documents, and more. One of the best features is how the text can be read out loud to struggling readers as well. You can find this website by clicking here. These websites are all great, but make sure that you teach the skills necessary for understanding nonfiction text. 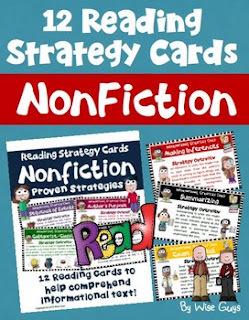 We have created nonfiction strategy cards that would be perfect for you to use in your classroom. You can find them by clicking here. We hope you take some time to explore the above websites and find one that best suits you and your students. We think you will be pleasantly surprised at how easy they are to use and how students will be excited to use them.